BELLEVILLE – Local residents are invited to take part in a peace vigil Wednesday evening to show support for victims of the Christchurch terror attack in New Zealand and to stand with local Muslims. The vigil takes place at 7 p.m. at Holy Trinity Evangelical Lutheran Church, 516 Victoria Ave. It has been organized by Holy Trinity and the Interfaith Quinte group of the United Nations Association in Canada Quinte Branch. 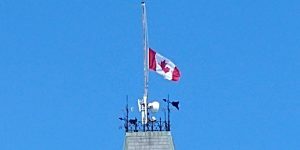 Meanwhile, the flag at Belleville City Hall was lowered Wednesday morning and will remain so until Thursday, to coincide with the peace vigil. Mayor Mitch Panciuk will address the evening vigil. A book of condolences has been placed at the Belleville Public Library for people to stop by and sign. 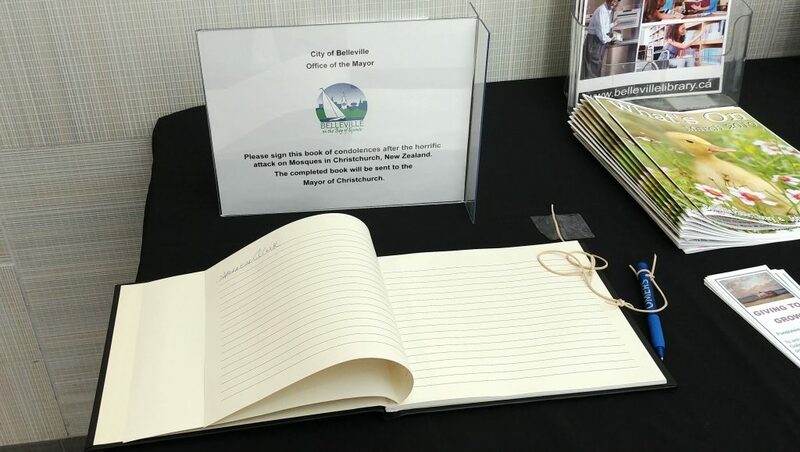 The book will be there for one week, after which it will be sent to the mayor’s office in Christchurch. “Please take a moment and visit the library this week to sign the condolence book,” Panciuk says in the news release. Last Friday, a shooter opened fire at Al Noor Mosque and the Linwood Islamic Centre in Christchurch during Friday prayers. The attacks killed 51 people and injured another 50. A 28-year-old Australian man was arrested and charged with murder. The alleged gunman published racist political manifestos and streamed the mass shooting on Facebook Live. U.N. Association, Quinte Branch Interfaith Group, & Holy Trinity Church invite you to a PEACE VIGIL, 516 Victoria Ave, Wed, Mar 20, 7pm, as we stand together with Christchurch Community, N. Z. & our Muslim families in Belleville. Prayers & condolences to victims & their families.